In case things don't go as planned. If Selkirk Tangiers cancels the day before your trip, we will try to rebook you if possible. If we are unable to rebook you, we will issue you a 100% refund. If Selkirk Tangiers cancels by 7:30 AM on the day of your trip, we will try to rebook you if possible. If we are unable to rebook you, we will issue you a 100% refund and you can enjoy a complimentary breakfast and a bagged lunch will be provided. If Selkirk Tangiers cancels after breakfast and safety training and rebooking is not an option, a $100 administration fee will be kept by STHS, with the remaining balance refunded to you. The administration fee can be used as a credit towards your next Selkirk Tangiers reservation; it will be non-transferrable and valid for two years. This will be provided as a voucher directly from STHS via email. A bagged lunch and a lift ticket to Revelstoke Mountain Resort will be provided. This lift ticket is valid any day of the current season, but is non-transferrable and cannot be resold. If you booked through a wholesale agent, refunds for the above scenarios will be delivered by the wholesale agent to you. If we start skiing but the guaranteed number of runs cannot be reached, STHS will refund you $178 plus tax for each run not achieved (double the extra run rate). In the worst case scenario of only skiing 1 run and rebooking is not an option, we will charge a flat rate of $440 + tax for all one day packages. The remaining balance will be refunded to your credit card in the days following your cancelled package. You will also receive a $100 credit voucher that can be used as a credit towards your next Selkirk Tangiers reservation; it will be non-transferrable and valid for two years. This voucher will be sent via email. A bagged lunch and a lift ticket to Revelstoke Mountain Resort will also be provided. This lift ticket is valid any day of the current season, but is non-transferrable and cannot be resold. If you booked through a wholesale agent, refunds for the above scenarios will be delivered by the wholesale agent to you. All guests will complete their safety training on the first day even if it is a cancelled ski day. In the rare circumstance we need to cancel both days, a $100 administration fee will be kept by STHS. The administration fee can be used as a credit towards your next Selkirk Tangiers reservation; it will be non- transferrable and valid for two years. This will be provided as a voucher directly from STHS to you via email. The remaining balance will be refunded directly to you. If you booked through a wholesale agent, the remaining balance will be refunded from the wholesale agent. A delicious buffet breakfast, a bagged lunch and a lift ticket to Revelstoke Mountain Resort will be provided each cancelled day. If we start skiing but the guaranteed number of runs cannot be reached, STHS will refund you $178 plus tax (double the extra run rate) for each run not achieved. STHS will refund this directly to you at the checkout in the retail shop. Every multi-day heli package with Selkirk Tangiers includes a certain amount of guaranteed vertical meters. If the guaranteed vertical target is not reached during your visit due to inclement weather, mechanical helicopter reasons or avalanche conditions, you will be refunded at a rate of $127 plus tax per 1,000 vertical meters. We do not refund guests who do not reach the guaranteed vertical amount due to poor skiing ability or fitness, illness or injury. If you choose not to ski on any given day during your package, you will still be charged for the minimum meters skied by your group. You were booked on a 3 Day Classic Package including 12,000 vertical meters and a guarantee of 9,000 vertical meters. Due to inclement weather, mechanical helicopter reasons, or avalanche hazard, you were only able to ski 8,000 vertical meters over the length of your package. Therefore the difference between the guaranteed 9,000 vertical meters on your package and what you skied was 1,000 vertical meters. You would be refunded for $127 plus tax. This credit is in addition to the vertical meter refund. This will be kept on account with STHS and can be used towards future STHS heliski package bookings within the next two years. After two years the credit will expire and is non-refundable. The credit is also non-transferrable and applies to the person who made the original booking only. Every heli ski package with Selkirk Tangiers includes a certain amount of guaranteed vertical metres. If the guaranteed vertical target is not reached during your visit due to inclement weather, mechanical helicopter reasons or avalanche conditions, you will be refunded at a rate of $180 plus tax per 1,000 vertical metres for Small Group packages. We do not refund guests who do not reach the guaranteed vertical amount due to poor skiing ability or fitness, illness or injury. If you choose not to ski on any given day during your package, you will still be charged for the minimum metres skied by your group. You were booked on a 3 Day Small Groups Package that includes 15,000 vertical metres and a guaranteed vertical of 12,750 vertical metres. Due to inclement weather, mechanical helicopter reasons, or avalanche hazard, you were only able to ski 11,750 vertical metres over the length of your package. Therefore the difference between the guaranteed 12,750 vertical metres on your package and what you skied was 1,000 vertical metres. You would be refunded for $180 plus tax. This credit is in addition to the vertical meter refund. This will be kept on account with STHS and can be used towards future STHS heliski package bookings within the next two years. After two years the credit will expire and is non-refundable. The credit is also non-transferable and applies to the person who made the original booking only. Every private heliski package with Selkirk Tangiers includes a certain amount of guaranteed flight time. If this guarantee is not reached during your group’s visit due to inclement weather, mechanical helicopter reasons or avalanche conditions, each group will be refunded at a rate of $3,700 plus tax per hour (or portion of an hour) for Private 407 packages OR $2,960 plus tax per hour (or portion of an hour) for Private AStar packages. We do not refund groups who do not reach their guaranteed flight time due to poor skiing ability or fitness, illness or injury. If a guest chooses not to ski on any given day during the package, the groups will still be charged for the flight time used by the other members of the group. You booked a 3 Day Private 407 Package that includes 4.5hrs flight time with a guarantee 3.0hrs. Due to inclement weather, mechanical helicopter reasons, or avalanche hazard, you were only able to fly 2.8hrs for the duration of your package. Therefore the difference between the guaranteed 3.0hrs flight time on your package and what you actually flew was 0.2hrs. Your group would be refunded 0.2hrs x $3,700, so $740 + tax. This credit is in addition to the refund and is per group. 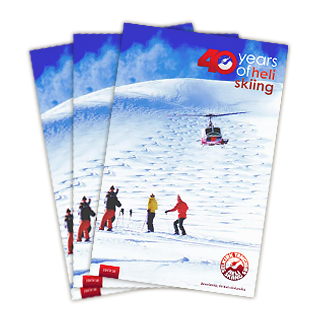 This will be kept on account with Selkirk Tangiers and can be used towards future heli ski package bookings within the next two years. After two years the credit will expire and is non-refundable. The credit is also non-transferrable and applies to the group/person who made the original booking only. *These included/guaranteed hours are based on 1-group privates. For hours included/guaranteed for 2-group privates, please inquire with STHS sales staff. Unless you can find a replacement, your deposit and final payments are non-refundable. Due to the costs involved with heli skiing and heli boarding packages, we strongly encourage you to purchase trip cancellation insurance. We strongly recommend purchasing cancellation and medical/evacuation insurance. We have worked with a local travel agency for over 15 years that offers affordable insurance which can give you peace of mind while on your skiing adventure. Please contact Uniglobe Specialty Travel: 1.866.667.0811 or by email at [email protected].